Could the new Sauna be replaced by a Kindergarten? Of the many problems facing the politicians in Oberursel, two have been recurring topics at council meetings in the past year. The cost of building a new swimming pool and the need for more kindergarten places, especially at the northern end of the town. Add to this the dilemma of the budget for 2013 being approved but with some restrictions in place, and – as treasurer Thorsten Schorr put it – “There can be no more discussion about building projects for services provided on a voluntary basis”. So what does that mean for the proposed sauna at the new swimming pool? The current plans for the new building include an area for a sauna, but only the walls, a temporary roof and possibly the utilities will be put in place. It was then planned to actually fit out the rooms at a later stage. 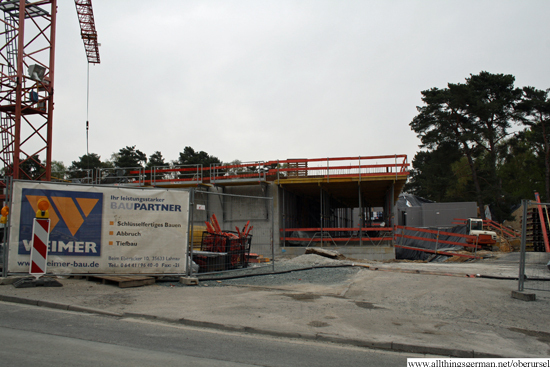 Work on the entrance to the new swimming pool building, above which the sauna was going to be. But local political group OBG have come up with a different suggestion. One that may solved two problems at once. Since the building is being built anyway, they have suggested using those rooms to house a new “swimming pool kindergarten”. They see several advantages for the town in this plan. Firstly, the town would have additional kindergarten places without the need for another new building. The infrastructure that will be in place for the swimming pool could be used by the kindergarten as well. There is a lot of open space outside with a playground already there. And just as other kindergartens offer groups that go into the woods each day, this one could specialise in teaching children to swim earlier than in “normal” kindergarten groups. In fact the idea is not as new as it may seem. There was a similar situation in a town called Rheydt, part of Mönchengladbach, with the slight exception that their swimming pool was in a listed building and was therefore refurbished rather than being replaced. The Rheinische Post newspaper reported last year that the part of the building that used to house the sauna is now home to a kindergarten with four groups. Maybe Oberursel’s executive could draw on their experience and should pay them a visit?